Have you ever wondered why Mexican food tastes so good? At Fiesta, we offer an array of Mexican dishes. We cannot tell you our secret Mexican recipes but we can enlighten you on its history and our favourite Mexican food. Our first favourite is the Burrito. Did you know the Burrito originated in a taco street stand in Mexico, by a man named Juan Mendez in 1910-1921? It is suggested he tried to find a way to keep his food warm for his taco street stand. In doing so he came up with the idea to wrap a homemade flour tortilla with a napkin. Such a simple idea, right? It was believed Juan Mendez’s food was a hit, in his local town. Burritos were then sold in areas of Northern Mexico using two main ingredients i.e. meat, beans, potatoes, chile rajas (green chilli & onion) or cheese in the burrito wrapped in a flour tortilla. In Mexico, the burrito was called “tacos de harina” or “flour wheat tacos”. At Fiesta, we serve burrito especiales with main ingredients including poached chicken, frijole & corn, spicy beef or chilli con carne. Another favourite classic Mexican dish of Fiesta is Fajitas. They are often associated with the idea of “make it yourself tacos” with ingredients used such as beef, vegetables, chicken or fish with onion and pepper cooked in a skillet. 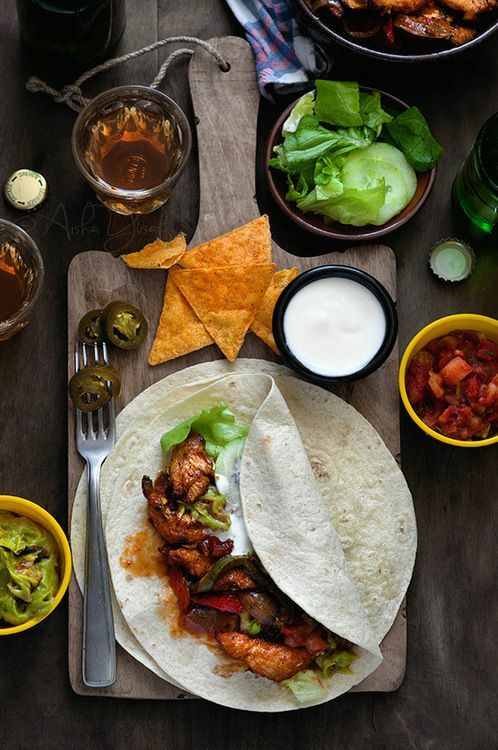 In Tex Mex terms fajita are referred to as “little strap”. This is because the steak used is carved into long and thin pieces. In the 1950’s Mexican cowboys called “Vaqueros” ate skirt steak. The vaqueros experimented different ways in which they could cook or prepare the meat. Their favourite way was to marinate the steak in tequila or lime juice. They found this made the steak tender and was sliced across the grain to prevent it from becoming tough. However, it was not until later that the first Fajita was publicly revealed at the Boerne Bergestfest. After that, during the next 20 years, the world became a Fajita craze! Our last favourite dish is Quesadillas or “little cheesy things”. This dish got its name from the Spanish word “queso” meaning cheese. A quesadilla is a tortilla that is filled with ingredients such as cheese, beans, potato, chicken or beef and is then folded over. After it has then been folded over it is heated on a griddle to ooze the melted cheese with the rest of the ingredients. In other words, it is a pretty fancy delicious Mexican toasted sandwich! Now that you know the history of our favourite dishes you may be feeling a little bit hungry. Don’t forget to join us today to try our classic Mexican food. We are open from 5 PM to late located in South Yarra, Victoria.